It’s been that time of month again at Kro 2 with their monthly whiskey tasting and this time incorporating the whiskies of the independent Scottish company Compass Box. Now I’ve personally never tried any of these whiskies before, although i have encountered Compass Box at bar trade shows in the past. Compass Box was only founded in 2000 by John Glaser, and in that short period of time they have explored the full range of Scotch, from the peatiest of malts to the richest of grains. Named after the street in Edinburgh where Compass Box is registered, it’s made combining 3 malt whiskies (two Northern Highland one Speyside) and 1 single grain whisky (Lowland) in never-before-used French oak barrels and American oak barrels. On the nose, a heavy scent of vanilla, citrus and some dried fruits with a sweet aroma hitting overall. As it moves onto your palate, fruity flavours gently hit your tongue which develops into vanilla, raisin and citrus. A creamy whisky that gives a long after-taste with a hint of spice. A Highland single malt whisky that’s vatted with a mix of 3 different malts for 12 months. The cask itself is a combination of French and American oak barrels, hence the name ‘Oak Cross’. On the nose it’s very light and sweet with a slight peat aroma emanating. The sweetness returns to the palate with vanilla notes making their way as well. A brief hit on the throat which gives a slow after-taste. Again another vatted malt from 3 single malts for a period of 24 months. The same cask process as ‘Oak Cross’ are used however they are burnt on the inside. Fruit aromas on the nose with a rich, spicy flavour igniting the palate that evolves into a lively well-rounded after-taste. 3 single malts (two Isles and a Speyside) are vatted together in American oak casks to produce a soft, peaty aroma on the nose. Hints of smoke arise as the palate senses a light, sweet whisky with a slight spice and floral hints which goes into a lingering smoky finish. Not as harsh as expected! First whisky to be created by Compass Box, a combination of grain whiskies in American casks that lasts for 20 years. A 100% grain whisky, rich flavours of coconut, toffee and vanilla create a creamy sensation on both the nose and palate, with the hints of grain in the background. A slight spicy end that gives a tingle towards the after-taste. An infusion of Scotch whisky and the natural ingredients of orange peel and spices for a period of 3 weeks, this unique spirit can’t be named as a Scotch whisky due to its involvement of different ingredients. On the nose it gives a short orange aroma (almost a Jaffa Cake flavour) with a smooth orange, vanilla and subtle spice taste on the palate that balance well to create a clean, fresh feeling. It’s almost likened to a dessert whisky and the orange liqueurs of Cointreau and Grand Marnier. Mid-way through the tastings, Kro supplied us with a delicious lamb-stew which went down very well in a cold and rainy Manchester! 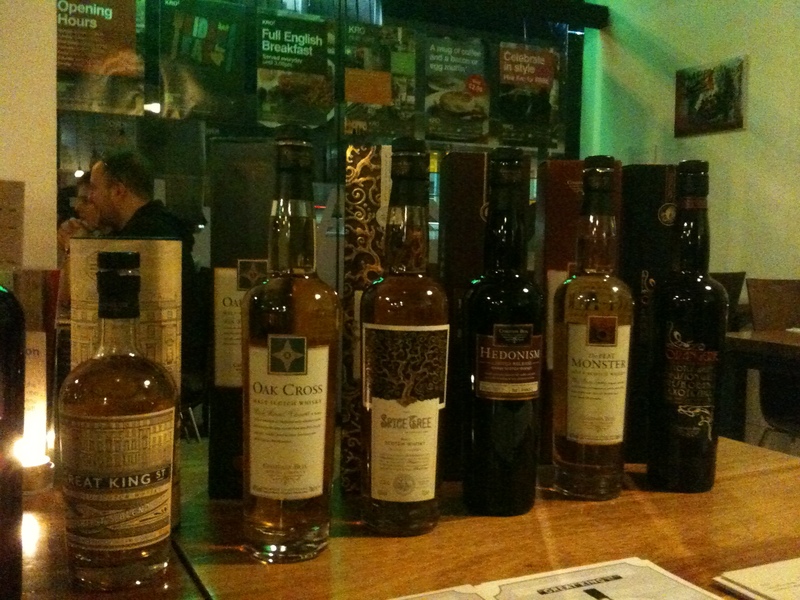 A thoroughly enjoyable event in which we were able to sample a good range of what Compass Box have to offer. Personal highlights were the Orangerie and Oak Cross, hopefully two items I’ll be picking up to add to my collection soon! Special thanks to Celine Tetu who displayed a great amount of knowledge of the whiskies on offer, and hopefully I’ll get to speak to her again when Compass Box make an appearance at the Manchester Whisky Festival next Saturday. Next month’s Kro 2 whisky tasting will be hosted by Maxxium Brands. On offer will be Ardmore, Highland Park 10yr, Macallan 10yr Fine Oak, Glenrothes Select Reserve and Laphroaig 10yr. 5 whiskies I’ve never tried, but can’t wait to taste!